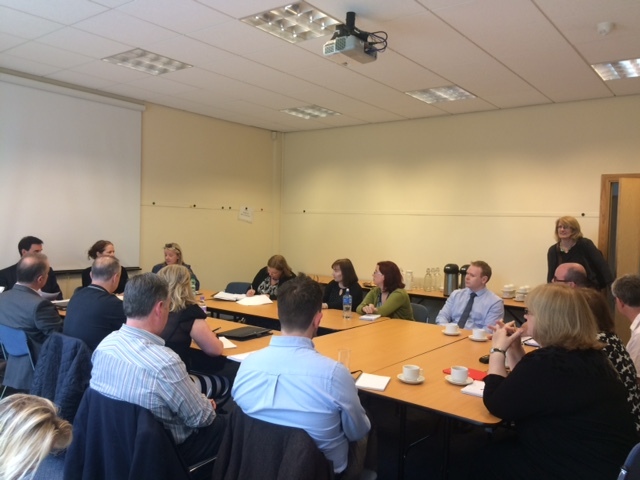 The first NICVA Employment and Learning DMG, chaired by Lorraine Boyd (Bryson Charitable Group NEETs Forum), welcomed DEL Permanent Secretary Derek Baker. The meeting's focus was the Departmental Restructuring as initiated by the Stormont House Agreement. A reduction in the number of departments from twelve to nine should be made in time for the 2016 Assembly election, with the new allocation of departmental functions to be agreed by the parties. Widely considered as one of the least controversial aspects of the Agreement, there is political agreement to progress it. Derek Baker volunteered to chair the Programme Board tasked with bringing it forward across the Civil Service. He is a self-proclaimed ‘turkey voting for Christmas’ as DEL functions will be split between the Department of the Economy and the Department of Communities. Derek told delegates that there would be no consultation as the changes were a machinery of government issue and not a change to policy, there is broad political agreement for the change and there is a relatively short time scale in which to complete the task. Derek continually stressed that the process of departmental restructuring was a real opportunity to govern more efficiently and effectively. This was a change programme and not simply a rebranding exercise. The first priority of the entire process was to define what the vision was: transformational change. There has to be two pieces of legislation passed in order for the changes to occur. The first is a ‘Departments Bill’ which includes the new names of the nine departments. This has already been written and agreed by the Executive. The second, the ‘Transfer of Functions Bill’ will contain the legislation required and all details of the transfer of powers occurring. Derek told delegates that while most of the transfer of functions were straight forward, there were grey areas in which some policy areas did not have a clear new home. Derek added that the biggest issue the Programme Board had was transferring functions that had no statutory footing which had been informally adopted by certain departments over the years. This was particularly the case for ‘children’s issues’ which have no foundation in statute and were difficult to define. Update: Both pieces of legislation will be the responsibility of the First Minister and deputy First Minister as OFMFDM is responsible for “machinery of government” issues. Both pieces of legislation are likely therefore to be scrutinised by the OFMDFM Committee of the Assembly. The Departments Bill, as a piece of primary legislation, will go through the full legislative Assembly process, whilst the Transfer of Functions Order is a piece of subordinate legislation and will be subject to what is known as Affirmative Resolution in the Assembly – so there will be an opportunity for debate on it in the Assembly (although it would not go through all the other stages to which primary legislation would be subjected). It is entirely possible that the OFMDFM Committee might invite other Assembly Committees for a view on the draft legislation in view of the impact it will have on other Departments, but that will be a matter for the Committee to decide. It is common for a Committee to invite other Committees for an opinion on something that impacts on other Committees’ areas of interest. Derek stated that the first port of call would be to confirm what the departmental structure was for each new department and how they were going to carry out their stakeholder engagement. He reassured delegates that management were aware that this needed to be nailed quickly to ensure stakeholders were clear of the new structures. Derek told delegates that although there wasn’t a formal consultation period, stakeholders would have the opportunity to consider the details and lobby throughout the passage of the ‘Transfer of Functions Bill’. There was a ‘heavy duty’ communications strategy planned to ensure stakeholders were kept informed of the changes. The strategy however was still in the early days of development by the Director of Communications and the departmental restructuring gateway team. Derek spoke honestly about the risks involved with the changes and identified them as logistical (the extent of the task), political (there could be delays in approving the transfer of functions legislation required) and financial (could potentially be negative financial implications in the changes). The departmental restructuring was also occurring in the context of wider public sector reform, local government reform and the voluntary exit scheme which complicated matters further. Talking specifically about the DEL, Derek told delegates that one of the primary objectives to the changes was saving money. Moving from 12 to nine departments meant three less Ministers, three less SpADs, three less Finance departments and so on. With Employment and Learning, half of the current powers was to go to the Department of Communities to include employment support services. The skills agenda (to include training for success), further educational colleges, apprenticeships, business support and youth training will all move to the Department of the Economy. It was unclear whether the department’s work on NEETs would move to communities or the economy but the Executive concluded it was better placed with the economy. Contract Management Function: DEL has responsibility for the managment of contracts, some of which have nothing to do with the department’s functions. It is unclear whether they will move to Communities or the Economy. Employment Tribunals: it hasn’t been confirmed whether they will move to the Department of Justice. Derek will return to NICVA in early September to provide a briefing to all community and voluntary sector organisations on the departmental restructure and what it means for the sector.